I know that I’m about to make a statement that some people will find controversial. There is a negative stereotype of people who work in technology. According to the stereotype, people who work in technology are socially awkward, out of shape nerds who just want to sit at their desk all day and work on their computer, and after the day is done, they like to go home and play video games. Although in many cases this is simply not true, people who aren’t involved in the IT field still think this stereotype is true. Unfortunately for IT professionals who are looking for bigger and better things in their career, this view ends up holding them back. If you want to move upward and onward, you need to do everything in your power to break that stereotype. The main way to break the stereotype is getting involved in other interests that give you secondary transferable skills that can move you upward in IT or help you get out of IT if that’s what your ultimate goal is. A side effect of getting involved in other interests is it can build your social network. Teaching and writing about technology is a good start. Writing for absolute beginners or for the layperson is a big plus, because it helps you with your communication skills. Teaching helps you with your public speaking and leadership skills, because as a teacher, you have to guide your students, and depending on at what level you are teaching, you have to show authority to students who may be a discipline problem. I, personally, started teaching and writing to help expand my horizons and build my career. I felt like I was being pigeonholed, and I wanted to build skills to help me get to the next level, so I started teaching post-secondary educational courses and writing a technology blog. Teaching made me more fearless when speaking in front of a crowd, and it gave me a more authoritative air since it made me stronger when dealing with students who either simply didn’t want to be there or felt entitled to special treatment. Writing the blog helped me communicate better with laypeople, since my target audience was people who were learning technology. Another side benefit was I was able to make a little extra cash with teaching. Volunteer for organizations that you believe in, and get involved in committees for activities for these organizations. An extra plus is taking on a leadership role, such as a scout leader or a chairperson of an organization. Volunteering helps build a plethora of skills, including: teamwork, public speaking, finance, project planning, interpersonal communication, writing, and leadership. Plus, you are doing good for your community. I know quite a few people in technology who are involved in volunteer organizations such as the Scouts or Rotary. I volunteered with the Junior League for a few years. Coaching in sports leagues also counts as a volunteer opportunity that can help you in your career. I’ve shared many examples about how volunteering helped some of my friends’ careers. Get involved in the creative arts. Whether it’s painting, textile arts, jewelry making, metal work, acting, and music, the creative arts helps keep the “right brain” skills strong, which in turn, helps you with being a more creative problem solver. I know of a large number of my colleagues who get involved in the creative arts, particularly music. Many of them write the music and lyrics as well as play in front of audiences. I’ve noticed that these people are better at coming up with creative solutions to problems than those who aren’t involved in the creative arts. Who knows? You may end up famous! Get involved in speaking and writing about topics other than technology and video games. You can create YouTube videos, present in seminars, or write a blog. What this demonstrates is your ability to learn and work outside of your comfort zone. 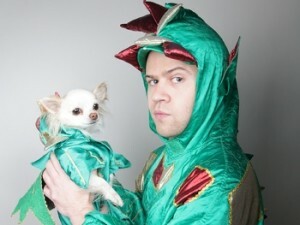 “America’s Got Talent” sensation Piff the Magic Dragon is an example of doing this. He worked in IT, but he also knew how to do magic tricks. He honed his craft while integrating a comedy routine in his act, and he ended up working corporate entertainment gigs. He eventually started doing this full time, and not only was he on various TV shows around the world, but he has a successful show in Las Vegas. If magic isn’t your thing, how about this idea: you may love to exercise, but you never thought about teaching exercise classes. How about choreographing exercise routines and either approach your local fitness center about teaching the class or make a video and publish it on YouTube? If you’re working in a corporate environment, get involved in corporate activities. This helps build your presence in the company, and it helps you demonstrate to others that you’re not some “tech nerd”. Involving yourself in corporate activity communities has the same benefits as getting involved in volunteer organizations. If you’re ready to step outside of the box, run for public office. Don’t do this just for the sake of building your skills – do it if you want to better your community. I know of two people in technology who ran for public office and are actively involved in their local government. Not only were they helping their community, but it was a major benefit to their careers, especially with building their leadership skills. Both ended up working in a managerial capacity, which was their career goal.